Welcome to Graduation Gown 101. I'm the host for today. this is not a new tv show. 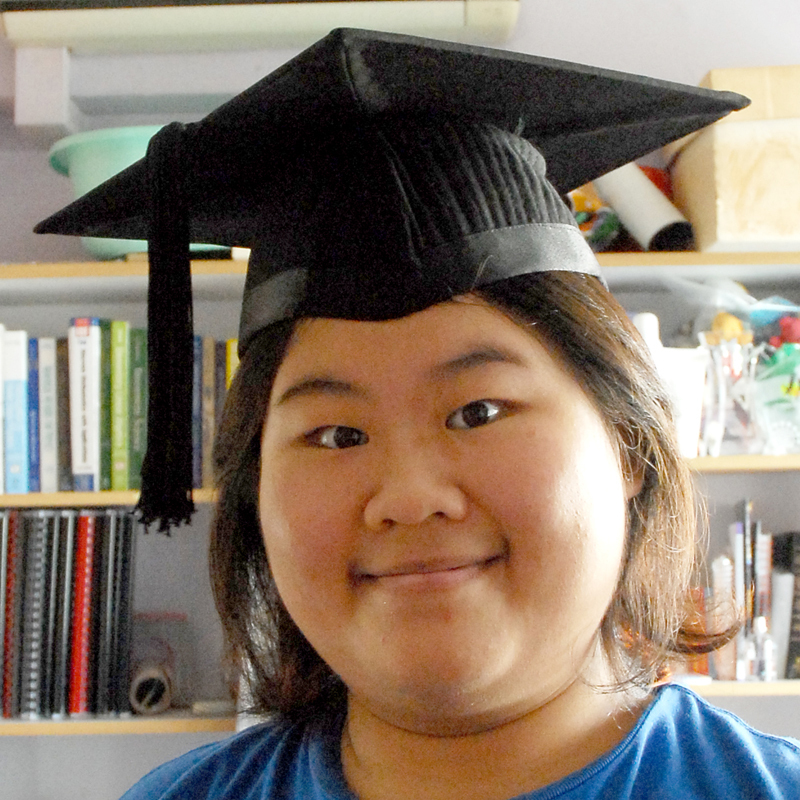 it just collected my graduation gown and commencement card this afternoon. the payment counter was rather slow cause they have to check your name in their system, make the payment and get the invoice printed. Then it's off to Station 1. 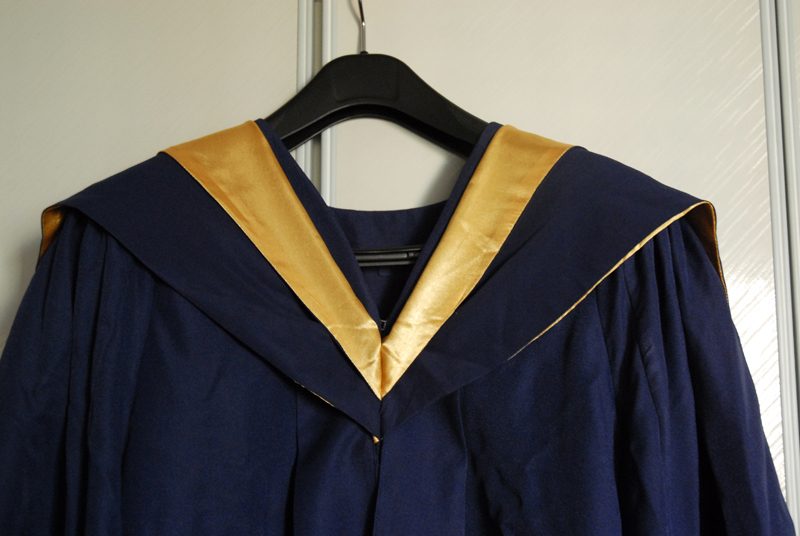 It's quite confusing cause they did not tell us that we need to pick the gown and the motarboard ourselves. 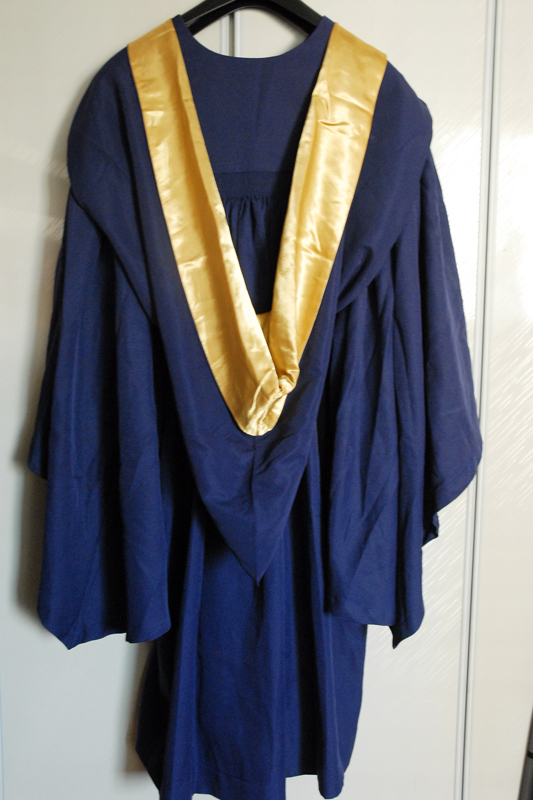 Luckily, I've already decided my gown and motarboard size so just need to pick the good gown (cause I noticed that some gowns are made from different type cloth) and ensure that the motarboard fits (actually, the M size feels slightly bigger than the one I tried at co-op when I went to check out the gown). 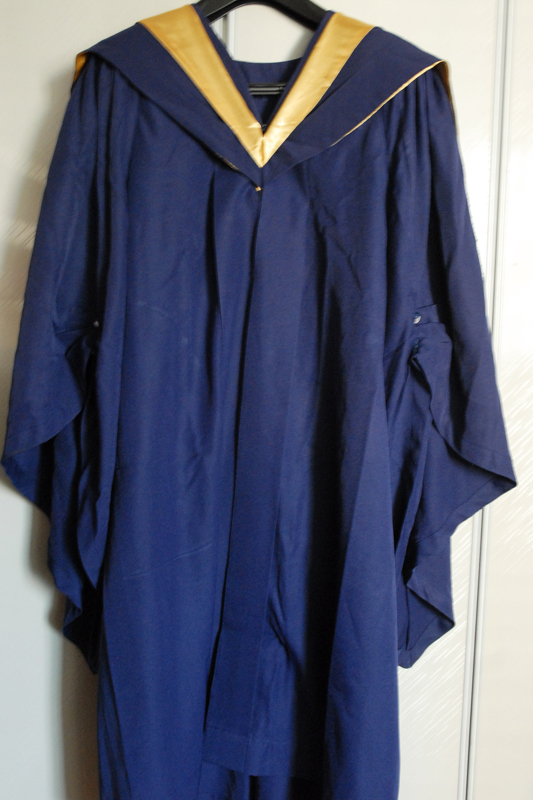 Anyway, I had some fun at home with the gown and took pictures of the hanging gown. Hood. Gold is for Science fac. The front of the gown (pardon for the bad take). 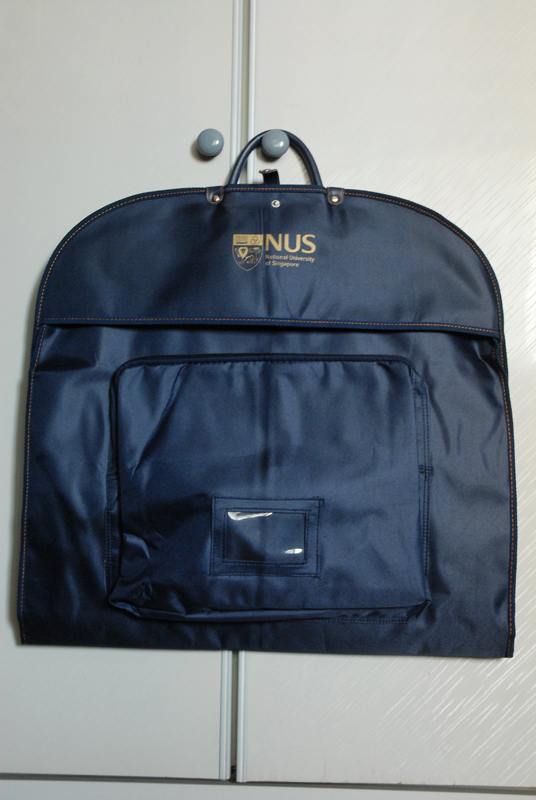 Not to worry, they have provided us with he gown bag with hanger to ease the trouble in carrying the gown around. Placing the gown in the gown bag will also prevent the gown from being creased. Alternatively, you can get the big NUSS yellow bag and keep the gown and gown bag inside if you find carrying 2 bags troublesome. 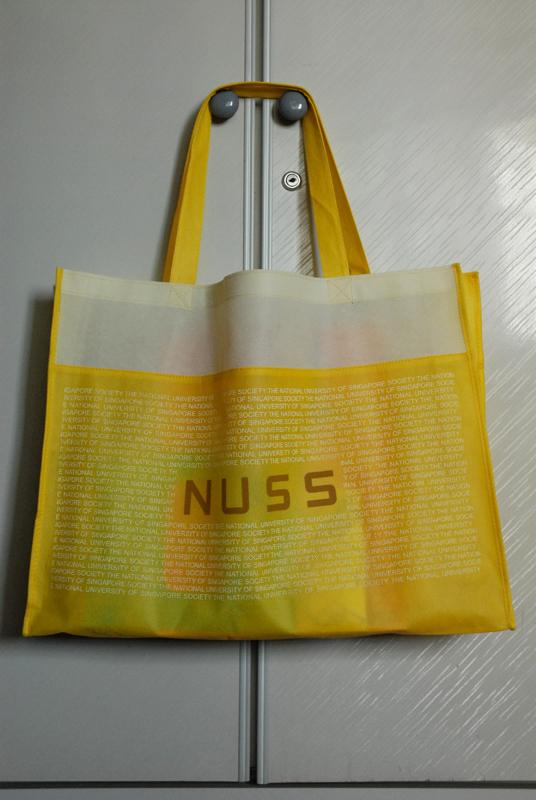 Tada, the NUSS bag (I use this to keep the rest of the gifts). 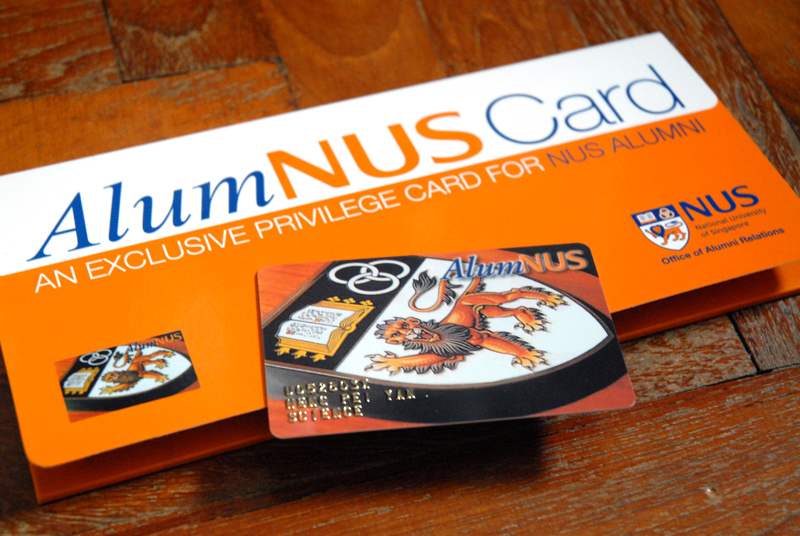 On top of that all graduates are given a AlumNUS card, to signify that we are alumni of NUS. Guess what, the card has discounts at Cathay Cineplex. Movie tickets are priced at $6 instead of $7 from Monday to Thursday, excluding public holidays and eves. There are also discounts at other shops. 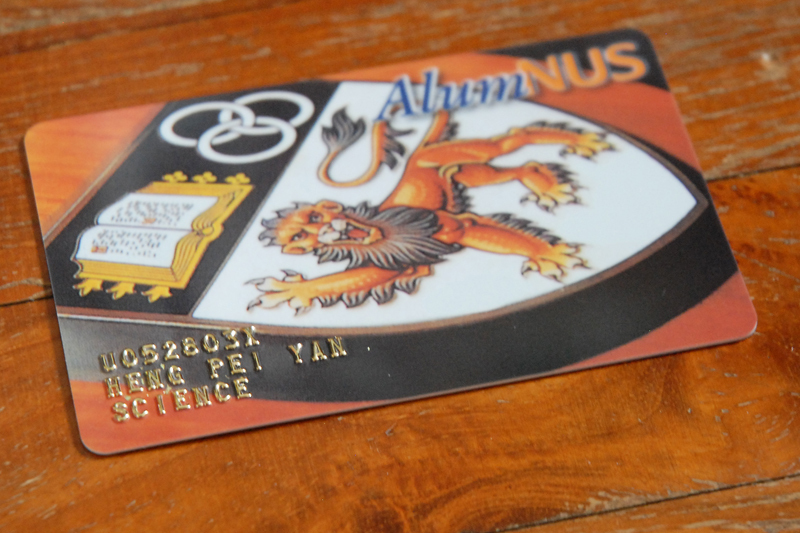 The AlumNUS card with the case. The card is customised with your matric number, name and faculty. The hood doesn't stay in that position all the time. I kept it in place in the shoot using safty pins. Actually there is a button hook to hook the hood onto the button of your shirt to prevent the hood from sliding backwards. The back of the hood is much heavier than the front so if the hood is not secured, it will keep sliding back. I'm quite blur cause I'm not sure how much of the Gold should be showing on the hood. The thickness in the photo by what I received so I suppose this is the thickeness? Anyway, the whole gown looks crumpled. Gotta iron it before my commencement.